I will be working crochet such beautiful crochet flower with 12 curled petals where 6 of them are big petals and other 6 are small petals. The base of the petals is complex stitches. 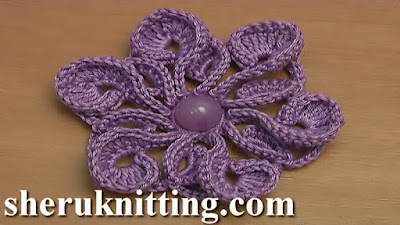 Each curled petal of this crochet flower made of different tall stitches. Crochet curled-petal flower was made of 100% Cotton Mercerized, 169m/50g, 4 ply; and with Steel Crochet Hook 1.5 mm or 2mm (#8 or #4 US standards).